Do you provide a cartridge recycling / refill service for Samsung CLX-6250FX toner cartridges? Hi, does using non-original Samsung CLX-6250FX cartridges affect the life or guarantee of the printer? As our CLX-6250FX printer is under guarantee, if there was a fault could the manufacturer blame non-original cartridges? Will compatible CLX-6250FW cartridges invalidate the printer warranty? The Office of Fair Trading ruled that the use of compatible cartridges alone cannot invalidate the warranty on your printer unless it's proven beyond doubt that the compatible cartridge has damaged the printer. Our compatible Samsung CLX-6250FX toner cartridges are very reliable and we've never had any instances where they've damaged a printer. For further peace of mind we offer you a full 30 day money back guaarntee on our compatible Samsung CLX-6250FW toner cartridges so if you do encounter any problems using them you can claim a full refund. I have a Samsung CLX-6250FX multifunction printer and want to know when the high yield recycled toner set will be available as listed on your website? Many thanks. Stock levels can fluctuate and if any item is out of stock we're working to update our stock levels as soon as possible. The compatible high capacity 4 colour Samsung CLX-6250FW toner cartridge set is now back in stock and you can order it through the website or by calling a member of our friendly team. Cartridge Save are industry-leading suppliers for bargain Samsung CLX-6250FX toner cartridges based in Britain. Nothing but the best offers are a certainty at Cartridge Save night and day. It'll no longer be necessary to spend ages hunting for Samsung CLX-6250FX laser toner cartridges nearby and wind up having to pay a lot more. Purchasing with us will help you to definitely spend less money and get the very best customer service. Get total peace of mind when you buy replacement Samsung CLX6250FX toner with us courtesy of our extensive refund promise that comes as standard . Don't forget to take into consideration that each order comes with completely free delivery, which generally gets delivered at your street address on the very following business day! This printer is network-ready and promises high-resolution documents even when printing in duplex mode. 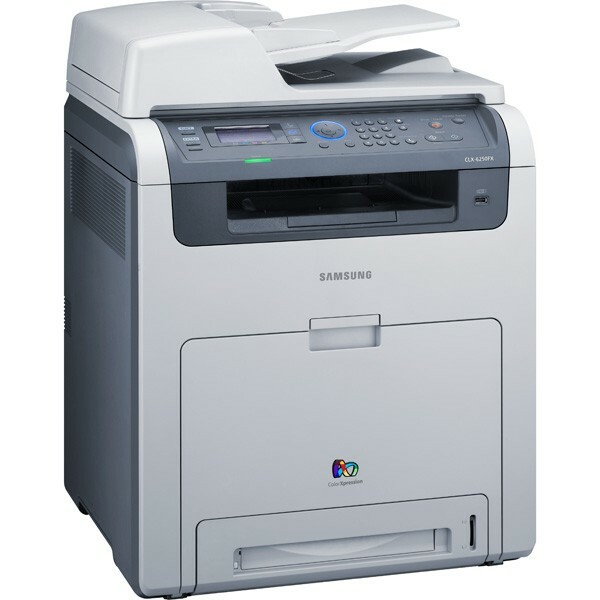 The Samsung CLX-6250FX is a multifunction printer that lets users enjoy fast copying, scanning, and printing, but it lacks essential connectivity options like WiFi and Bluetooth. It also deserves a larger and more advanced LCD screen. The Samsung CLX-6250FX is an energy-efficient machine boasting Instant Fusing Technology and a Power Save ModeDirect USB Interface so you can transfer and print files with ease. It is capable of printing up to 25 ppm in both colour and monochrome – and is fast for its size. Cartridges can handle up to 2,500 pages. The machine itself is 18.4 inches wide, 19.6 inches tall, and 26.5 inches in diameter. The fax machine is speedy and has auto-dial for up to 240 entries, while the colour flatbed scanner delivers high resolution scans. The display is slightly improved at 4 lines, 16 characters. All controls are user-friendly. Duplex-printing is built-in, and the copy speed is fast at 25 ppm. This versatile copy machine can do 4 and 2 up copies, ID copies, poster copies, and clone copies. Both the fax and scanner are ITU-T G3-compatible. The standard 256MB RAM is upgradeable to 768MB to complement the 700 MHz processor. Compared to similar Samsung printers, the CLX-6250FX is bulkier and heavier at 82.5 lbs. Bluetooth and WiFi connectivity are not available.